Leo Vecellio, Jr., center, with National Academy of Construction President Hugh Rice, left, and Vice-President Tom Sorley, at the Oct. 26 induction ceremony. 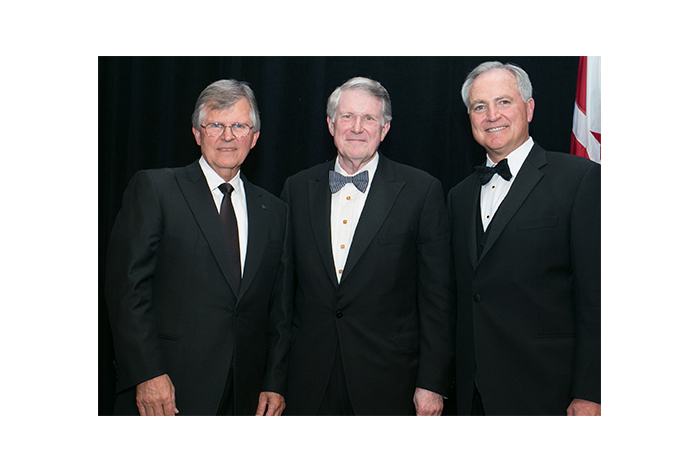 Leo Vecellio, Jr. Oct. 26 was inducted into the prestigious National Academy of Construction. The longtime ARTBA leader is chairman and CEO of West Palm Beach, Florida-based Vecellio Group, Inc. In addition to his leadership roles within ARTBA and his family’s businesses, Vecellio is active in numerous industry, educational and business associations. He is on Florida’s Council of 100 and a member of the Florida Transportation Builders Association (FTBA). He is a founder of West Virginia’s Flexible Pavements Council and is active in the state’s contractors association. Vecellio is the recipient of the ARTBA Award, the association’s highest honor, and the Nello L. Teer, Jr. Contractor Division Award. He has been inducted into the Virginia Tech Academy of Distinguished Alumni and its Academy of Engineering Excellence, the Georgia Tech Academy of Distinguished Engineering Alumni, the West Virginia Academy of Civil Engineers, and the FTBA Hall of Fame. Palm Beach Atlantic University bestowed upon him its American Free Enterprise Award. All of us at ARTBA congratulate Leo on his induction into the NAC.